Gold is on fire, but why is it on fire? 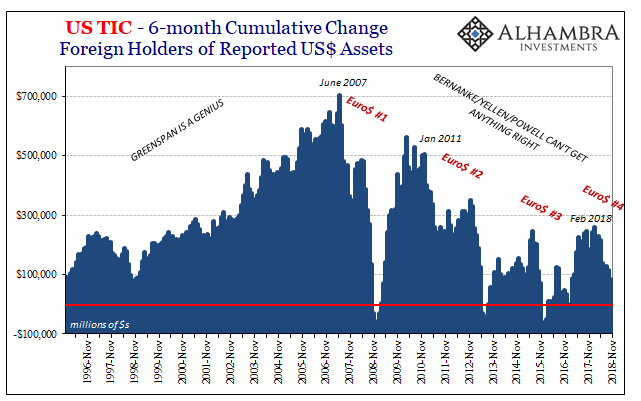 When the precious metals’ price falls, Stage 2, we have a pretty good idea what that means (collateral). But when it goes the other way, reflation or fear of deflation? Stage 1 or Stage 3? 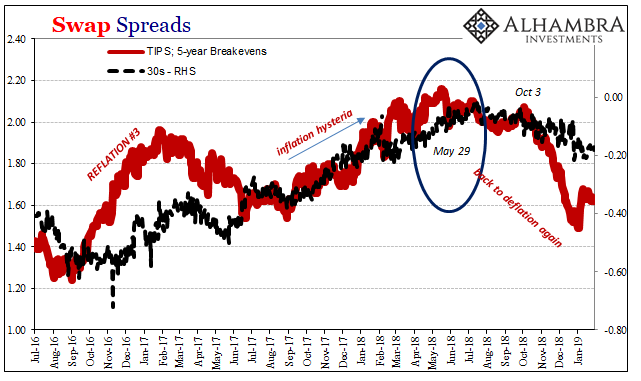 If it is Stage 1 reflation based on something like the Fed’s turnaround, then we would expect to find US$ markets trading in exactly the same way. 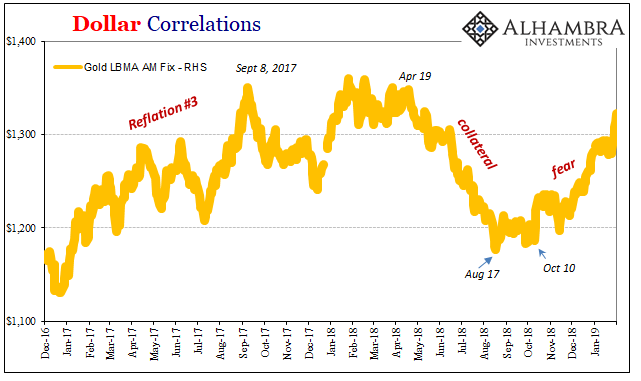 Like 2017, when gold was last rising, there should be reflationary corroboration in rising rates, current and expected, along with inflation expectations and curves. That’s not happening here or anywhere. 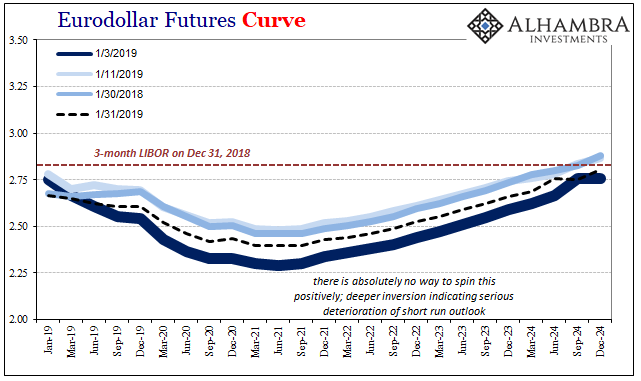 Even as the “bond market” including eurodollar futures has retraced some of December’s awfulness, it really hasn’t been all that much and the curves are still highly distorted (liquidity risk, therefore clear deflation signal). This one, a very important set of prices, goes into the fear column. Maybe gold is up because of something the Chinese are doing. 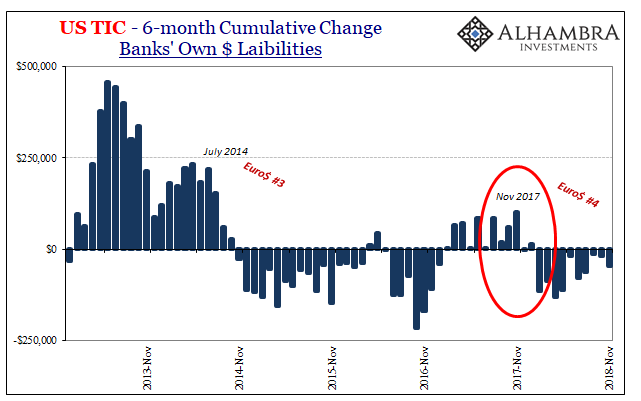 Some kind of reflationary “stimulus” that gets the whole thing restarted after the aborted soft landing the last half of last year. Gold, after all, isn’t determined solely by what may be happening US economy-wise or even in eurodollar capacities. China in monetary overdrive might seem an inflation risk worth hedging. Except, gold really started moving upward back in October when China was engulfed in deflationary liquidation (right from the start of its reopening from the National Day Golden Week). Despite several attempts at “stimulus”, which isn’t stimulus, the Chinese economy continues down the deflation track unabated. The first look at January 2019 inside China isn’t encouraging. 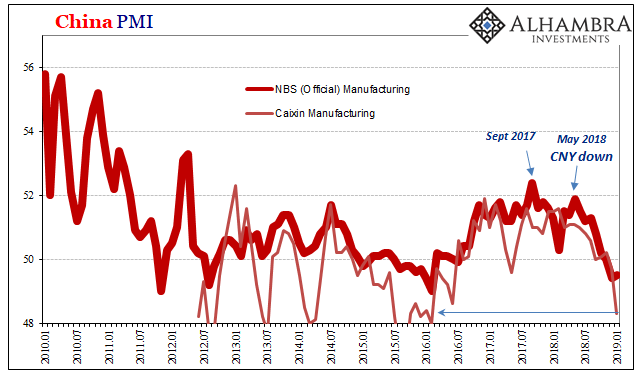 The Chinese NBS reports today that the manufacturing PMI remained below 50 for a second straight month. Though the overall index was marginally higher than December, the subindex for New Orders declined a little further below 50 (and New Export Orders quite a bit below 50). 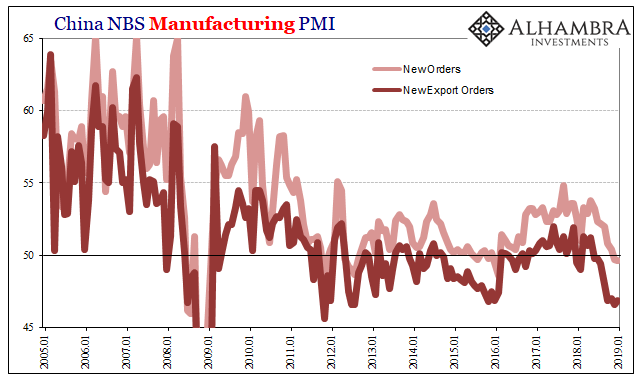 It doesn’t appear Chinese manufacturing is going to turnaround in the next few months. Neither the New Orders nor New Export Orders components have been this low since the worst point of the global downturn 2015-16. That’s also true of the separate Caixin Manufacturing Survey. Measuring more of medium-sized Chinese producers, this PMI declined to 48.3 in January. It was 51 just seven months ago. Even what might seem like good news isn’t. 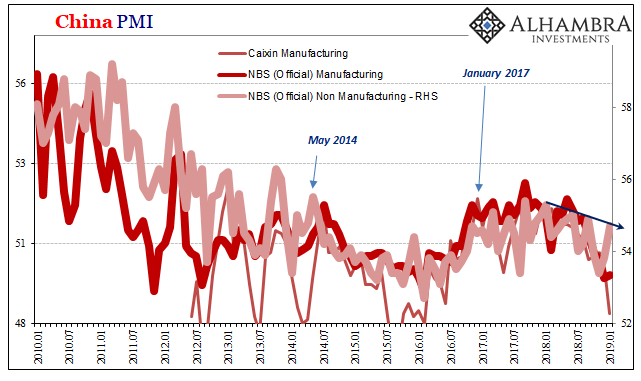 The NBS PMI for the services sector rebounded to 54.7 last month from 53.8 the month before. However, this merely continues the same volatile sawtooth pattern, one that has taken on a downward trend of lower highs and lower lows. Not as fast in deceleration as manufacturing, still the wrong direction. In another report, China’s NBS estimates about industrial revenues and profits for December 2018 show even more deterioration than what’s figured in their PMI’s.  On an accumulated basis, Revenues from Principle Activities gained just 8.5% for December. That means for the full-year 2018, sales growth was 8.5% above the total for all of 2017. 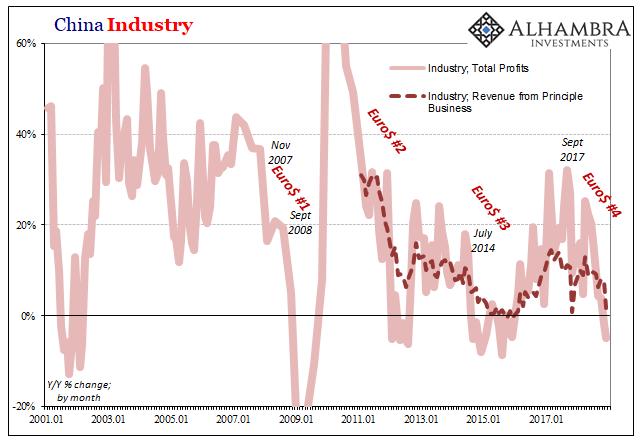 In terms of Total Industrial Profits, the accumulated growth rate for December was down to just 10%. These are not encouraging results. Because accumulated estimates can be biased by what happened early in any year, pulling apart these numbers by month instead gives us a better sense of more recent conditions and directions. On a monthly basis, China’s industrial deterioration is stark: revenues were up just 1.6% year-over-year in December alone, while profits fell by just about 5%. This is certainly where the PMI’s and industrial figures agree; manufacturing and industry in China hasn’t been this bad since the last time the whole world was in a downturn. If Chinese industry is behaving like it did in early 2016, the worst parts of Euro$ #3, it sure raises questions about the state of the global economy right now. I’m pretty sure this one goes in the fear column, too. That would leave reflation gold with just Jay Powell and Mario Draghi on its side. Since neither of them has any idea what’s going on, I’m not sure other than stocks there is much to think that they’ll get the response right even eventually. Fed funds at 240 bps didn’t break China, nor did trade wars (though they haven’t helped). In other words, what we are seeing are the variable economic effects of Euro$ #4 just now picking apart the global economy. The Federal Reserve is as much a bystander to it as it was in Euro$’s #1, 2 and 3. The FOMC bungled all those, too, but now it suddenly transforms into an effective, honest bureaucratic machine? I’d put that one as far into the fear column as the ledger will allow.